Author Harold Enlow is a renowned wood carver and if he can't teach you how to carve wood, nobody can. Enlow has over a dozen books to his credit and has taught carving for several decades. In this book he breaks down the anatomy of a face. He shows you how to carve in various expressions just by tweaking the eyebrows. The author shows you how to carve faces with life and expression like no other. Everything from an Indian chief to a cowboy, Santa to a witch and a charming female to a wood spirit, even an 'ugly' face is included. Should this be your first attempt at facial carving the author will show just you how easy it can be. 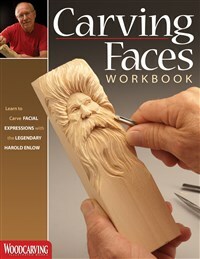 Harold has written twelve wood carving books and teaches 30-35 woodcarving seminars each year. He is a founding member of Caricature Carvers of America and a member of the National Wood Carvers' Association, the Ozark Whittlers and Wood Carvers, and several other carving groups around the country.